"This little rover gets around on rough terrain pretty well. [Dean Segovis] built it using parts from a Roomba. The Roomba uses wheels in conjunction with gearboxes that handle a lot of the dirty work in getting this prototype going. [Dean] grabbed four of them, as well as the motor controller board and batter, and installed them on this Rocker-bogie suspension." "Video gaming has become one of the globe's most popular pastimes. Fans say games are often educational, their detractors answer they are anything but. Might ESA have something to learn from gaming? A new Agency study says the answer is yes. It comes from ESA's Technology Observatory, which is tasked with scanning non-space sectors to look for developments with potential for spin-in or joint research. 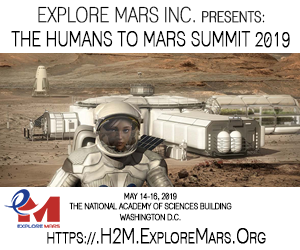 The study, Online Game Technology for Space Education and System Analysis, looks at potential applications of different online game-playing technologies from the simplest content-oriented games through to Massively Multiplayer Online (MMO) virtual worlds." "In a recent conversation with the Mercury News, Worden talked about how an upcoming Ames moon mission could be a first step toward an "interplanetary Internet," and said Obama's recent decision to cancel NASA's plans for a moon landing does not mean America is going to stop sending people into space. Quite the contrary - he hasn't given up on the dream of going himself." Stay tuned to NASAHackSpace as we provide updates on the Titan 1 restoration, the Lunar Orbiter Image Recovery Project, and other radical or unusual things happening at NASA Ames Research Center - and elsewhere in and around NASA. 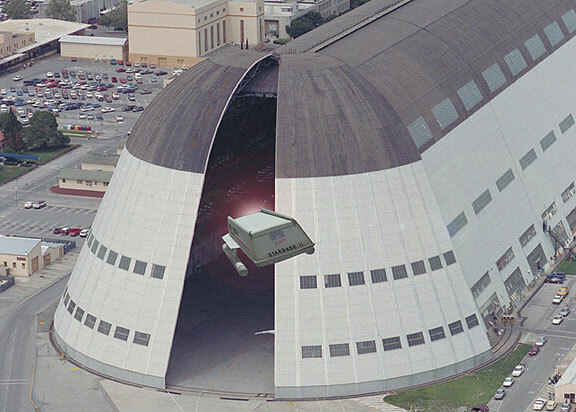 The Titan 1 has arrived at Building 596 at NASA Ames Research Center. Photos by Matt Reyes (via Twitpic) show the process of loading things onto the transport trucks. Photo (above) by Dennis Wingo shows the final installation. 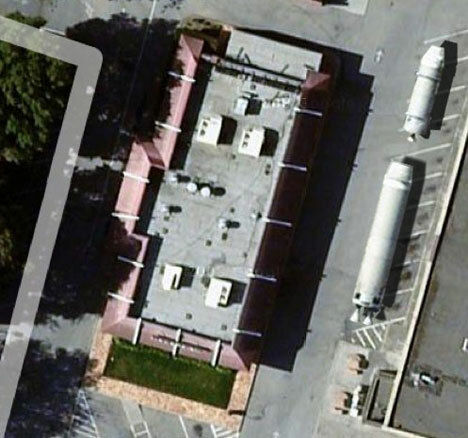 As the current plan goes, the move of an aging Titan 1 ICBM from its current location at NASA ARC to its new home next to Building 596 starts around 7:30 AM PST on 18 March 2010. This Titan 1 was brought to ARC in 1969 and was used in a variety of tests to study buffeting of launch vehicles during atmospheric ascent. The rocket has been sitting outside since the early 1980s as an exhibit next to the (former) Ames visitor's center. 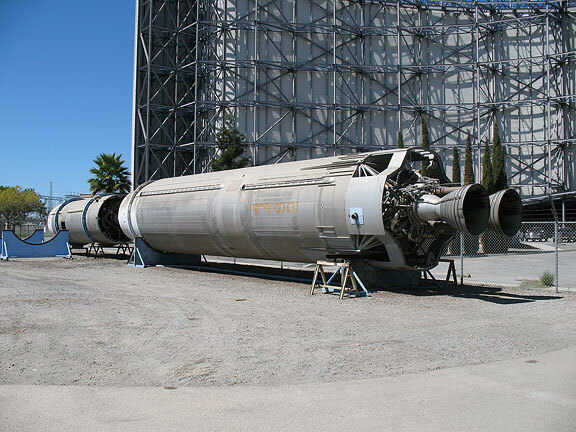 A team has been assembled that will restore this rocket and upgrade it to serve as an educational tool as well as a smallsat payload integration testbed - much in keeping with its original appearance at Ames 41 years ago. 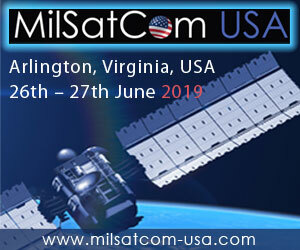 This project will be undertaken at NASA Ames Research Center at Building 596 aka "McMoons" where the Lunar Orbiter Image Recovery Project (LOIRP) has been under way for 2 years. The Titan 1 team includes SpaceRef Interactive Inc., SkyCorp Inc, and the Challenger Center for Space Science Education. The intent is to involve a wide range of local groups and citizens of all ages in this project in a crowd-sourced, participatory exploration format. As the current plan goes, the move of our Titan 1 from its current location to its new home next to Building 596 starts around 7:30 AM PST on 18 March 2010. This map (click to enlarge) shows the route that the Titan 1's two stages will take. Once loaded onto its transport, it will head south on R.T. Jones Road. Then it will take a left and go through Gate 18 and head straight on King Road. It will then go right around the back side of Building N243 and then head through the back gate of N243 onto Bushnell Rd. It will then veer left onto Bushnell Rd., enter the Hangar 1 site through the northeast gate onto Sayre Ave, and head past Hangar 1. After it passes Hangar 1 it will veer right around the south end of Hangar 1. and exit the West Gates on to Westcoat Road. 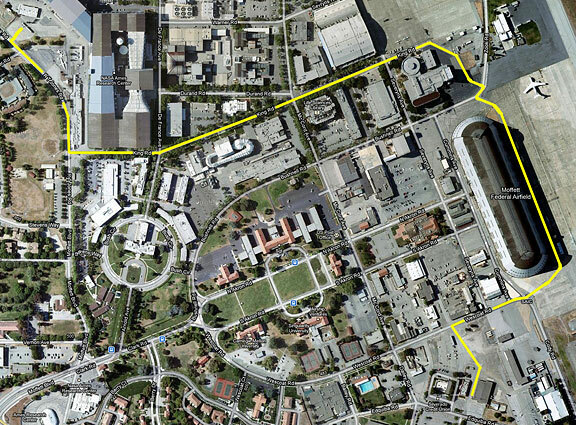 It will then head west and turn left into the back parking lot of Building 596 ("McMoons"). We'd love to have folks Twitter if they see our Titan go past them - use #titan1 to tag if you do post a Tweet or a picture. You can also email images to kcowing - at - spaceref.com and we'll post them here. According to Glenn E. Bugos, Ph.D. from the NASA Ames History Office: "The Titan I was brought to Ames in 1969, along with an Atlas missile, and they were among the last items tested in the Structural Dynamics Laboratory (N242). The SDL was built to study buffeting during atmospheric ascent. A photo ran in the Astrogram (24 December 1970), of the Atlas moving into the vacuum tower. The tests, on active vibration control, were run by Jerome Pearson, with help on the mounting from Bruno J. Gambucci. Both worked in Code SVS, the Structural Dynamics Branch run by Al Erickson and Henry Cole, which was part of the Vehicle Environment Division run by Al Seiff and David Reese. Pearson and Gambucci published one paper on the set up of the tests. We do not know where Ames got the missile. Ames did a variety of studies related to the Titan in the early 1960s--notably Don Buell's work in the 12 foot on wind gusts around the upright missile, and work on the POGO phenomenon for the Gemini program. But all of that work was done on scale models; there was no full scale Titan here before 1969. The Titan I was retired from active service in 1965, and the USAF likely considered this one scrap. Pearson and Gambucci's test was paid for by the Space Shuttle program office. As early as November 1974 the two Titan I stages were on static display with the Atlas in the parking lot between N204, N237 and N206. The Atlas had been dented during the tests, and it was not kept on display very long. Sometime between 1980 and 1984 the Titan was moved to the static display area of the then-new Ames Visitor Center." 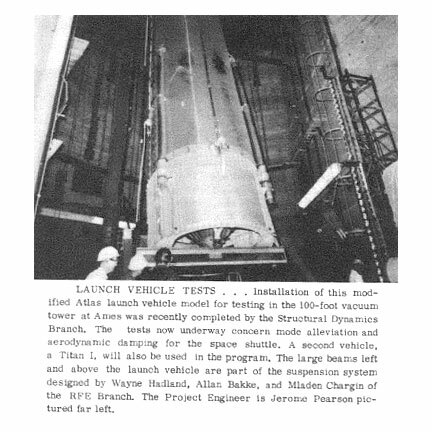 Dr. Bugos also incuded a copy of this paper which describes how this Titan 1 was originally used at Ames as part of a test stystem to simulate rocket launches. "A Unique Model, Suspension, and Excitation System for Launch Vehicle Dynamics Studies", TMX 67397, Jerome Pearson and Bruno J. Gambucci, Ames Research Center, NASA. 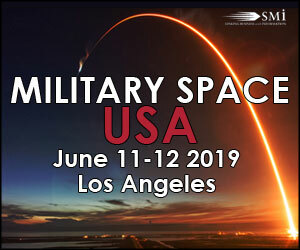 Abstract: "A description is given of a flexible model, feedback-controlled suspension, and modified electromagnetic shaker for use in launch vehicle dynamics studies. Test results indicate the effectiveness of the system in simulating the launch phase of liquid-fuel vehicles. Tests are now under way to develop a large vehicle system, using an Atlas and a Titan 1 with an 89,000 Newton (20,000 lb) force thruster." Update: According to a May 2010 posting on the Yahoo missile_talk discussion group, our Titan 1, 61-4492 (SM-65) was based at Larson AFB in Washington. 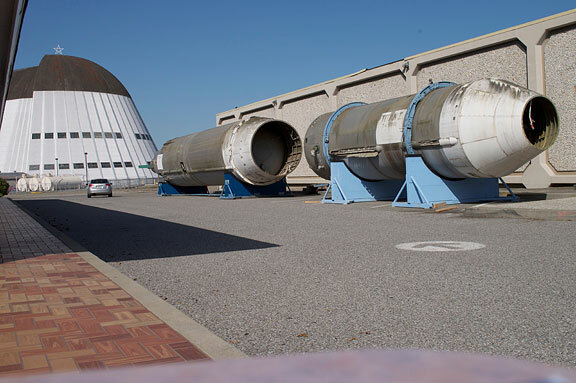 This a Titan ICBM 1 first and second stage in the location where they have sat neglected for 40 years. We are going to restore this rocket and upgrade it to serve as an educational tool as well as a smallsat payload integration testbed. This project will be undertaken at NASA Ames Research Center at Bldg 596 aka "McMoons" where the Lunar Orbiter Image Recovery Project (LOIRP) has been underway for 2 years. The rocket is slated to be moved to its new location on Thursday 18 March. Titan 1 first and second stage in the location where they have sat for 40 years. "Revenge of the Nerds" meets "American Idol" - Help Select the top high school innovators! Help 25 of the top high school innovators design the future! On March 29th, the Spirit of Innovation Awards challenges YOU to vote for your favorite teams and help select this year's "Pete Conrad Scholars!" Over the past 6 months, 25 finalist teams have created real products to solve some of the grand challenges facing society. From the depths of the oceans to the edges of space, these students will knock your socks off! Piezo-electric wallpaper, robotic astronaut assistants, advanced water purification systems, and Navajo Solar "Frybread" ovens; these are just a few of the amazing products high school students are designing. To see all of the teams check out www.conradawards.org, and remember, online voting is open March 29th through April 9th. Winners will be announced April 10th during the 2010 Innovation Summit at NASA Ames Research Center. More than 100 student teams from around the globe will drive their specially crafted lunar rovers through a challenging course of rugged, moon-like terrain at NASA's 17th annual Great Moonbuggy Race in Huntsville, Ala., April 9-10. Some 1,088 high school, college and university students from 20 states and Puerto Rico, Canada, Germany, Bangladesh, Serbia, India and Romania are expected to participate in the race at the U.S. Space and Rocket Center. Video: Would a Lava Lamp work on Jupiter? Would a Lava Lamp work on Jupiter with its higher gravity? To find out, I built a large centrifuge out of Meccano and spun up a lava lamp. For more information go here. Note the smartphone doing data collection. "Playing with apps on an Android phone is fun. Building your own apps, even more so. But what about using the phone to operate a moving, talking bot? Tim Heath and Ryan Hickman have done exactly that. The bot they recently finished building -- Truckbot -- is still relatively simple. It's got an HTC G1 phone for a brain, riding on top of a chassis with some wheels and treads. All it can do is roll around on a tabletop, turn and head off in a specified direction. When I visit the workshop where they're building it, Heath and Hickman show how it can use the phone's compass to make itself point to the south. But the duo have much more ambitious plans in mind. "I knew I could build this thing. I just needed a phone," explains Heath, a Python web engineer. He posted on various e-mail lists looking for one, including that of Hacker Dojo, a Mountain View, California, hackerspace. Hickman, who works for Google's Doubleclick division, but has no connections to the Android people, saw Heath's pleas." "The discovery was made by a member of the public, using the Stardust@Home internet application, which invited participants to search the aerogel collection medium for tiny particles of the dust. "There are two particles, but they are in the same track. So when they hit the aerogel, they were together - they are two components of the same particle," Dr Westphal told BBC News. "But they are very different from each other. That in itself is interesting, because if this does turn out to be interstellar dust, then it is a bit more heterogeneous than people thought." The initial speck, known as particle 30, was spotted by Bruce Hudson, from Ontario in Canada. Under the agreement made between the science team and participants in Stardust@Home, Mr Hudson was allowed to choose a name for the particle; he called it Orion." The Titan I was the United States' first true multistage ICBM. 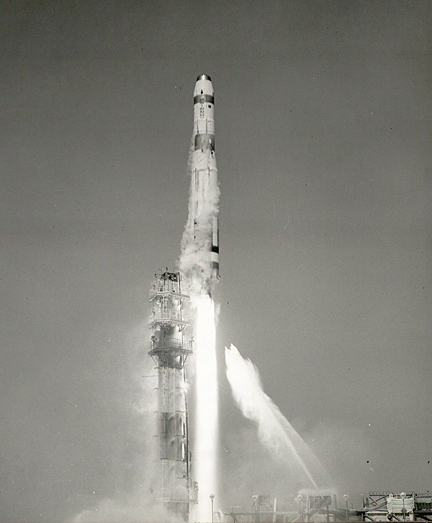 It was the first in a series of Titan rockets, but was unique among them in that it used LOX and RP-1 as its propellants, while the later Titan versions all used storeable fuels instead. The program began in January 1955 and took shape in parallel with the Atlas (SM-65/HGM-16) intercontinental ballistic missile (ICBM). The Air Force's goal in launching the Titan program was twofold: one, to serve as a backup should Atlas fail; and two, to develop a large, two-stage missile with a longer range and bigger payload that also could serve as a booster for space flights. The Titan I HGM-25A, initially called the SM-68 - originally it was the XB-68 before the Air Force began designating missiles as SM for strategic missile and TM for tactical missiles. The XB-68 designation was originally assigned to a Martin supersonic bomber concept that was canceled during the design phase. Produced by the Glenn L. Martin Company (which became "The Martin Company" in 1957), Titan I was a two-stage, liquid-fueled missile. The first stage delivered 300,000 pounds thrust (1,330 kN) of thrust, the second stage 80,000 pounds thrust (356 kN). The fact that Titan I, like Atlas, burned RP-1 and LOX meant that the oxidizer had to be loaded onto the missile just before launch from the underground storage tank, and the missile raised above ground on the enormous elevator system, exposing the missile for some time before launch. The complexity of the system combined with its relatively slow reaction time - fifteen minutes to load, raise and launch the first missile, made it a less effective weapon system. Titan I utilized radio command guidance. The inertial guidance system originally intended for the missile was instead eventually deployed in the Atlas E missile. 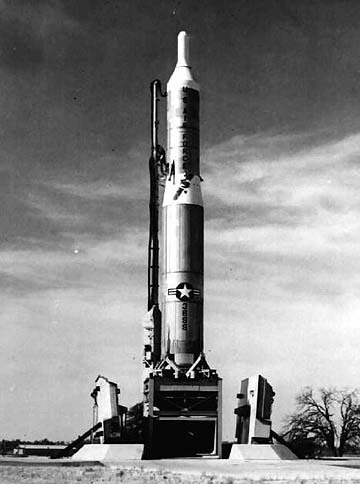 (The Atlas series was intended to be the first generation of American ICBMs and Titan II (as opposed to Titan I) was to be the second generation deployed). An inertial guidance system would have allowed Titan I, once launched, to guide itself independently to a pre-programmed target. It would not have relied upon continuous radio command signals from a ground location, or upon the ability to receive and react to such signals. 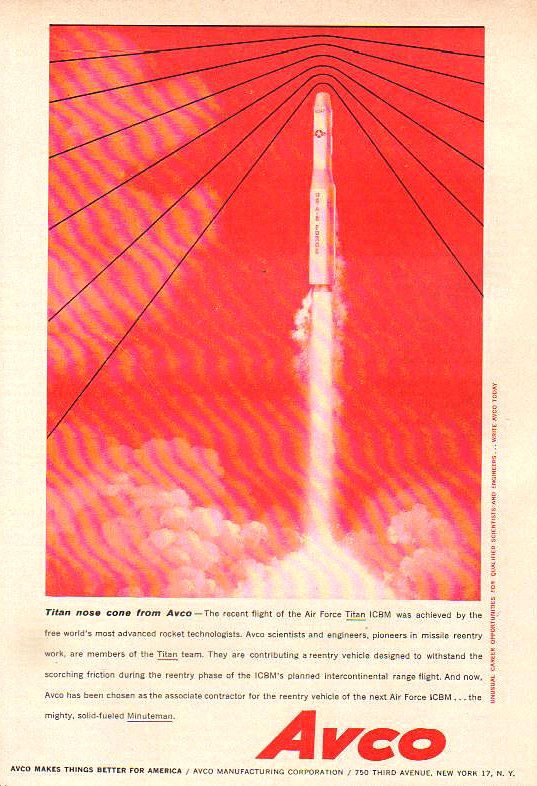 Titan I also was the first true multi-stage (two or more stages) design. 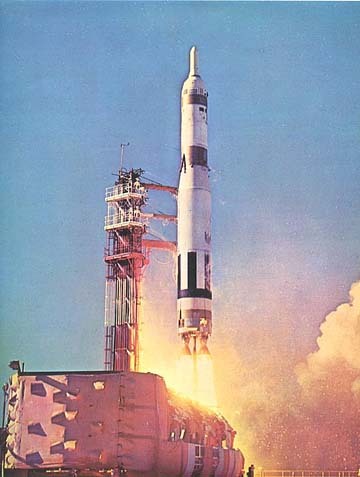 Whereas in Atlas, all rocket engines were ignited at launch (including two small thrust vernier engines) due to the unreliable nature of the engines, Titan I's second stage engines were reliable enough to be ignited at altitude, after separation from the first stage booster; and its fuel tanks, engines, launch interface equipment, and launch pad thrust ring. Titan I's ability to jettison this mass prior to the ignition of the second stage, meant that Titan I had a much greater total range (and a greater range per pound of second stage fuel) than Atlas, even if the total fuel load of Atlas had been greater.